At Fiberoptic Components, our OEM customers rely on us to support them through every stage of their products’ life cycles – from concept to obsolescence. For OEMs, there comes a time in every product’s life cycle when producing and supplying replacements to end-users becomes dilutive to new and future products – especially when those replacements require small quantities and/or wide varieties of obsolete legacy cables. Fiberoptic Components solves this problem. As a fully-authorized and vertically-integrated partner, Fiberoptic Components can be relied upon to craft and execute customized replacement cable programs that fulfill the long-term supply needs of end-users and safeguard the reputations of our OEM partners. And while we ultimately supply directly to end-users, we only do so with the full-authorization of our OEM partners. At every step, we want to be partners to our OEM customers, not competitors. By solving the complex challenges of replacement cable fulfillment, Fiberoptic Components enables its OEM customers to do what they do best: focus on new and future products. The Product: Our Customer’s surgical illumination devices are preferred by surgeons, O.R. nurses, biotechnicians, and medical equipment service personnel throughout the world, based on a well-earned reputation for superb illumination and long-term durability. The Challenge: Given their rigorous applications and environments, individual fibers within our Customer’s illumination devices inevitably become damaged, thereby reducing light intensity. The most frequently damaged cables are those used with retractors, particularly breast retractors, as well as those used in cardiac surgery. Ultimately, all light cables have a finite life and need to be replaced – requiring our Customer’s end-users to find replacement cables. The Solution: To solve this challenge, the Customer chose Fiberoptic Components as its exclusive authorized provider of replacement cables for its legacy surgical instruments. Since then, the Customer’s end-users have sourced their replacement cables exclusively through FOC and FOC in turn has delivered higher than 99.5% on-time delivery and quality product. Problem solved. Production continues. The Conclusion: The Case Study above is just one example of how Fiberoptic Components supports the long-term replacement cable needs of our OEM customers and their end-users. 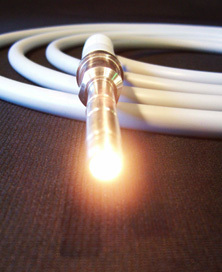 With superior in-house design, material, and manufacturing expertise, we can build a customized fulfillment program for a broad host of fiber optic illumination applications and supply exact, ready-to-use, plug-and-play replacements, including all of the standard end tip types such as Storz, Wolf, ACMI, and Olympus. To discuss how Fiberoptic Components can fulfill your Company’s replacement cable needs, please call Customer Service at: (978) 422-0422 ext. 224. Contact our applications engineer today to get started on your custom application solution!